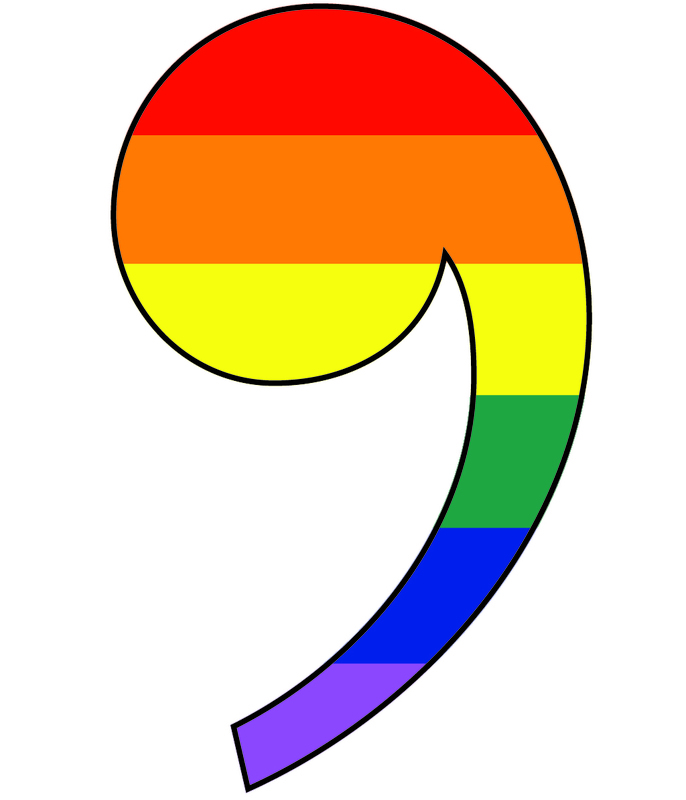 Punctuation’s main purpose is to signal to the reader what parts of the sentence go together. And more complicated information leads to complicated sentences! So be sure and go over your paper looking for sentence problems. Fixing those will help you communicate more clearly to the reader. In my teaching and editing careers, I have corrected a lot of comma mistakes! 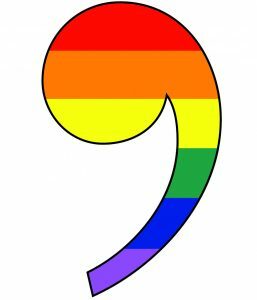 So here are some of the most common comma issues, along with some guidelines…. it’s the meaning that matters, so know the rules, but know your meaning too. Usually the rules and what creates the right meaning will coincide (that’s why the rules evolved, because both readers and writers agree on the usual meaning). Just don’t go against the rules without good reason. 1) Introductory phrases are usually set off by a comma to make it clear what’s the introductory phrase and what’s the main clause. In 1880, London citizens were paralyzed with fear because of Jack the Ripper. 2) At the end of the sentence, there`s more flexibility. 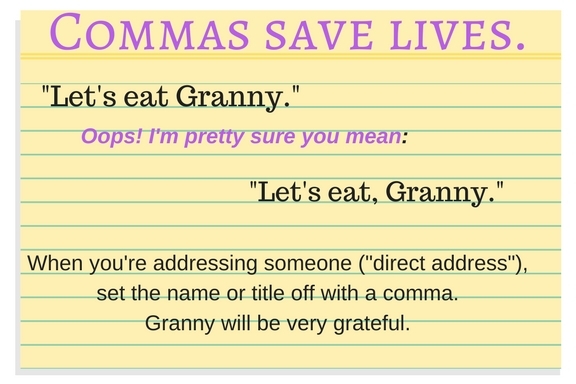 Commas can clarify meaning, so use them if necessary. “You are enjoying this little spot of torture, aren’t you?” John said, sticking the poker back in the fire. “Aren’t you?” is a tag question, and those are always set off by commas, as they are separate clauses. The participial phrase “sticking…” is set off with a comma because it is an action that goes along with his speech, not how he speaks– that is, it is a separate unit of additional meaning there. “I`m serious, Prince Harry! Marry me, or I`ll turn you into a frog,” the witch said. Pete, thanks for the help. But most appositives are set off with commas. An experienced birdwatcher, Miles knew exactly the sort of haunts favored by the rubythroated warbler. 5) Quotes and quote tags (she said) require special handling. If you attach a quote directly to a quote tag, then put a comma inside the close-quote. “Now don’t tell me that wasn’t fun,” Paul said, turning an exultant face to Angela and Trudy. 6) Complex and compound sentences (which have more than one clause– subject plus predicate) very often use a comma to separate clauses. Complex sentences have a dependent clause plus independent clause. A dependent clausehas a subject and predicate, but will be a sentence fragment if by itself as there`s a “subordinating” or “dependent” conjunction that diminishes it, like although Linda never wanted to hurt anyone. There are many subordinating conjunctions, but some of the most common are although, since, because, if, after, until, as, when. See, here is a situation where my knowing the rule lets me decide to break the rule under certain circumstances. I tend to use a comma before a trailing dependent clause when I think it enhances the meaning of the particular sentence. That’s more common with certain conjunctions, and certain situations… try the sentence both ways and see which works best for you. I notice I’ll often go with a comma more with a longer sentence or one with several modifiers. After the concert, Ricky walked slowly by Lucy’s apartment again, though he knew she was in there with Tom. With so many modifiers, I’d set off that final dependent clause so it doesn’t get lost. Unless the sentence is very short (Grace tried but she failed), go with a comma plus one of the conjunctions. Matthew would always be a part of her life, but maybe Tom could be too. Lawrence pretended to be listening to her sing “R-E-S-P-E-C-T,” but really he was wondering how he was going to tell the boss that they didn`t have enough to make payroll. 7) Parentheticals are comments or asides– interruptions, usually– which can be taken out without measurably changing the basic meaning. “Parentheticals” aren’t usually actually in parentheses! Parentheticals are almost always set off with a comma before and a comma after. Lola was, how shall I put it, a coldhearted monster. Cornelia spoke her mind, yeah, and I thought that was refreshing, not that she cared what I thought. If the parenthetical is actually in parentheses, btw, there`s usually no need for commas. Louis tilted his head (another new gesture) and listened for a wolf howl. 8) Items in a series are separated by commas. Don`t pay attention to that journalistic rule that dispenses with “the terminal comma” before the and. That can confuse, and takes away a writer`s flexibility. With tears in her eyes, Muffy accepted the Best Actress Trophy and said, “I wouldn’t deserve this without the support of my sisters, Matthew, and Tom.” That makes it clear that she’s thanking her sisters and two male friends, Matthew and Tom. Now see why it`s important to maintain the distinction created by the terminal comma. With tears in her eyes, Muffy accepted the Best Actress Trophy and said, “I wouldn’t deserve this without the support of my sisters, Lisa and Joan.” The reader knows that Lisa and Joan are the names of her sisters, not two additional unrelated friends. That is, the lack of the terminal comma is what clues us in that Lisa and Joan are not items in a series, but rather the appositive for the noun sisters. Just remember: Commas help readers understand your meaning. Know what you mean, and punctuate accordingly. 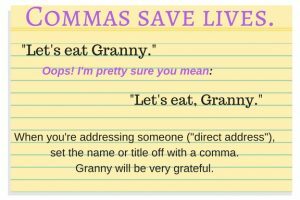 “Proofreading for Commas” gives proofreading tips for finding missing commas. The best way I’ve found to learn how sentences work is to diagram sentences. This gives you a graphic and hands-on way to analyze what roles different words and phrases play. 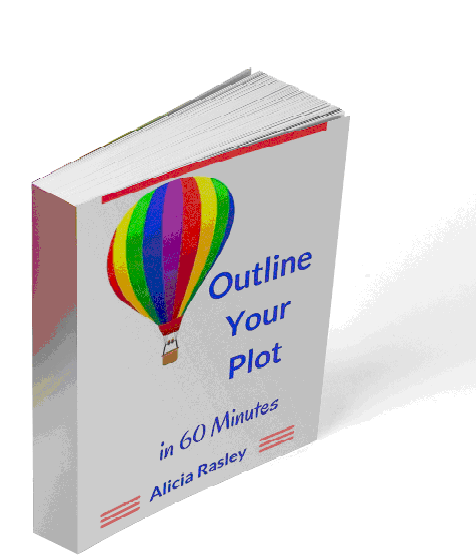 Here’s a great site with lots of sentence diagramming exercises. Be sure and find the “Enter” button in the middle of the front page to get access to the exercises. Really, this is fun! Trust me!